IT USED TO BE said that Labor Day was when voters finally turned their focus to the presidential campaign. If this is where you spent the last 10 months, the presidential campaign may seem fresh and interesting. The rest of us are sick to death of it. That may have been true once upon a time, way back in the Mesozoic Era. But who hasn't had their fill of the 2016 race by now? 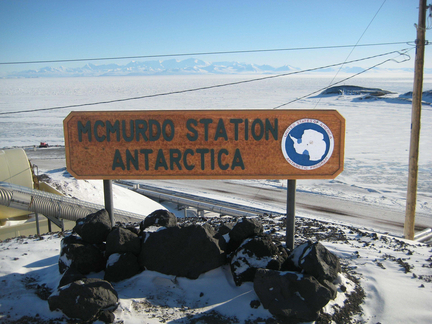 If you've just returned from a long assignment to McMurdo Station in Antarctica, you may be tuning in for the first time to the race for the White House. The rest of us are desperately counting down the days until this endless campaign is over. 1. Require the parties to pay for their own primaries. Taxpayers aren't forced to underwrite the balloting for inductees to the Rock and Roll Hall of Fame or the election of board members at Microsoft's annual shareholders meeting. They shouldn't have to subsidize the Republican and Democratic parties' primary elections, either. Political parties are private organizations. And primary elections, their seemingly official "election day" trappings notwithstanding, are private functions. Parties are under no legal obligation to choose their nominees by means of primary voting — for most of US history, primaries didn't even exist. As recently as 1960, primaries were held in just 15 states. Letting party members vote directly for delegates to national conventions was meant to democratize the nominating process. Whether empowering rank-and-file voters at the expense of establishment insiders was a sound idea can be debated. But voters certainly like it. As primaries proliferated, campaigning for those primaries started earlier and earlier. But none of that alters the fact that primary "elections" are internal organizational events, not constitutional obligations. If the Democratic and Republican parties had to absorb the costs of their own balloting — just as the Rock and Roll museum and Microsoft do — they might find primaries less appealing. And if the emphasis on primaries shrank, the length of the primary season would too. 2. Rotate the starting lineup. Nowhere in the Ten Commandments is it decreed that Iowa and New Hampshire must enjoy first-in-the-nation cachet forever. The tradition of having presidential aspirants undergo a bout of retail campaigning in smaller states is valuable and appealing. But candidates now all but take up residence in Iowa and New Hampshire for the better part of a year — an unhealthy, distorting overreaction. A simple reform would be to randomly designate two different states, drawn from the 20 with the smallest populations, to go to the head of the line every four years. That designation should be made no earlier than New Year's Day of the presidential election year. No one would know in advance which states were going to get the quadrennial "retail" status, so no one would overrun those states with campaign workers and field offices long before any voting was to occur. Political campaigning could start much later. And candidates could wait longer before committing themselves to a race. 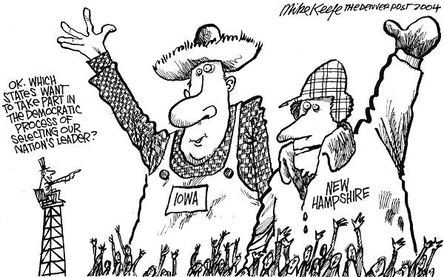 Rather than encourage candidates to campaign for months on end in Iowa and New Hampshire, the "first in the nation" states should be changed every four years. Choose them by lottery on Jan. 1 of the election year, and presidential campaigns would be markedly shortened. 3. Cluster the primaries by region. Divide the country into five zones — Northeast, Midwest, South, Great Plains, and Pacific — with primaries (and caucuses) in each zone held on the same day. With a different region voting every two weeks, the entire primary calendar could be condensed to two months. The voting could start in June and end in August, with conventions to follow in September. That would yield a far saner schedule — less exhausting and expensive for the candidates, less inescapable and infuriating for the rest of us. Presidential campaigns have grown outlandish. For the better part of two years now, we marinate in politics — in the slogans and debates, the insults and accusations, the never-ending polls and promises and punditry. Americans don't see eye-to-eye on much these days. But surely we can agree on this much: Our elections are inhumanely long, and need to be shortened before we all go crazy.